... it appears that economists are starting to change their mind, and now none other than the Trump administration itself now estimates that the cost of the government shutdown will be twice as steep as originally forecast. 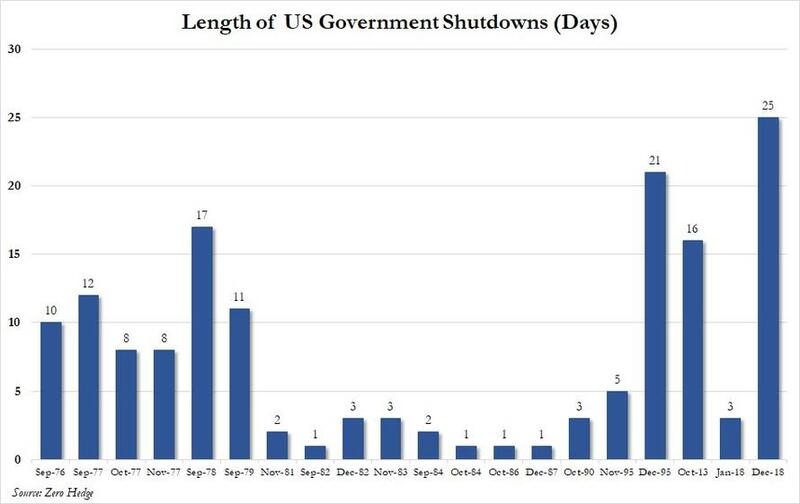 As CNBC's Steve Liesman reports, the original estimate that the partial shutdown would subtract 0.1% from growth every two weeks has now been doubled to a 0.1% subtraction every week, citing an unnamed official. While the administration had initially counted just the impact from the 800,000 federal workers not receiving their paychecks. But they now believe the impact doubles, due to greater losses from private contractors also out of work and other government spending and functions that won't occur, according to CNBC. Furthermore, the admin official said that if the shutdown lasts the rest of this month, it could subtract a sizable half a percentage point from gross domestic product, which if one assumes a sharp drop in inventories as retailers are forced to liquidate unsold products - something Macy's warned about last week - could potentially shift Q1 GDP into the red. The subtraction from growth would add to the troubles of an economy already thought to be slowing from waning effects of tax stimulus, trade tensions and gathering global weakness. What is curious, is that the administration's own estimate is far more aggressive than several forecasts from Wall Street economists. Yet even those estimates which have assumed a roughly 0.1 percentage point cut to growth every two weeks, have been rising as it now looks like the shutdown would drag on for much longer than anyone had expected. Some, such as Moody's chief economist Mark Zandi, forecasts a half of percentage point hit to GDP if the shutdown lasts through March, which is roughly a third of the administration's new estimate. "We estimate (the shutdown) will reduce first quarter real GDP growth by approximately 0.5 percentage points," Zandi wrote in a research report. "Of this, about half will be due to the lost hours of government workers, and the other half to the hit to the rest of the economy." Zandi said his estimate could worsen if the administration can't continue to triage the effects of the shutdown or if the administration can't issue tax refunds. A more ominous forecast, that from Pantheon's chief economist Ian Shepherdson, sees the combination of the shutdown and the tendency of the first quarter to be statistically weaker than the other three potentially pushing Q1 GDP growth negative. "If the shutdown were to last through the whole quarter, we would look for an outright decline in first quarter GDP," Shepherdson wrote in a report. Of course, the irony is that because of the shutdown, much of the high frequency data that economists need to estimate GDP is be indefinitely delayed. Several key economic indicators are not being published because government data collectors and number crunchers have been furloughed. While labor reports are being issued, the December retail sales report — the most important of the year because it includes Christmas sales — will not be issued this Wednesday. That also means that it is unlikely that the government will be able to issue the fourth-quarter GDP report due Jan. 30th, should the government not reopen before then. A BEA official could not say when or whether the GDP report can be issued. "There is no way for us to know until we get back and evaluate all the various data sources that go into the advance estimate of GDP," said the official. There is another potential complication: the Fed itself will not have access to key economic data to make a determination if the economy is indeed slowing as the market appears to suggest. Coincidentally, CNBC notes that the GDP report was to have been issued on the second day of the Federal Reserve's first meeting of the year, where the central bank is struggling to figure out the extent of the slowdown and how to tailor interest rate policy. But in a statement, a Fed spokesperson appeared to play down the importance of the missing data so far in the central bank's decision-making. "While having the full complement of government data available would be beneficial, the Federal Reserve's staff assessment of economic conditions takes into account a wide range of information from government and private-sector sources, as well as readings on financial and international developments, and staff continue to provide a detailed economic picture for policymakers," the statement said. The good news for the Trump administration is that while the US economy may slide into contraction this quarter, should the shutdown persist indefinitely, there will be nobody to report that GDP is now negative. Meanwhile, the feud between Trump and Democrats over who "owns" not only the shutdown but the potential recession, escalated with every passing day.